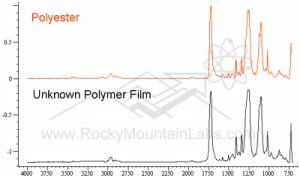 Fourier Transform Infrared Spectroscopy - Materials Science | Rocky Mountain Laboratories, Inc.
Rocky Mountain Labs in Golden, Colorado specializes in fourier transform infrared spectroscopy to determine the types of molecular structures that are present in a vast array of materials. We use this process to analyze and identify organic and inorganic compounds, including resins, starches, enzymes, and proteins. If you’re interested in learning more about our services, contact our team today. 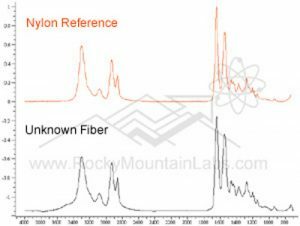 What Is FTIR Used For? FTIR Analysis is used to analyze organic materials. Bulk and small particle materials can be analyzed. FTIR microscopy allows for the identification of particle as small as 10 µm. Determination of unknown materials is facilitated by spectral matching to a library of over 250,000 reference spectra. Infrared spectroscopy is the study of interactions between matter and electromagnetic radiation. Atoms in molecules and crystals continuously vibrate with natural frequencies in the range of 1013 to 1014 cycles per second, which is the frequency of infrared radiation. Vibrations which are accompanied by a change in dipole moment cause absorption of infrared radiation. Several vibration modes may occur for a particular atomic group, each at a particular frequency which is normally independent of the other modes. If the amount of radiation absorbed by a substance is plotted against the incident wavelength, the resulting graph reflects the presence of specific chemical bonds and can therefore be used for structural identification. Whereas spectra associated with atoms are caused by electrons moving from one electronic energy level to another, inter-atomic spectra are usually characterized by either bond stretching or bending vibration modes. In addition, to these fundamental absorption bands, there are multiples of the fundamental frequencies (overtones) and frequencies which are the sum and difference of two or more fundamental frequencies, called combination lines. Wavelength is conventionally expressed in microns (µ) and frequency in wavenumber – the number of cycles per centimeter, with units of cm-1. Infrared spectroscopy is probably the most powerful single technique available to qualitatively identify organic materials and to determine molecular structure. Mass spectrometry gives the molecular weight and formula, and nuclear magnetic resonance the number and type of protons, but only infrared indicates in a direct manner the presence of key functional groups. A match between the infrared spectra of an unknown sample and a reference sample is a simple, and almost positive, method of identification. Currently, over 130,000 reference spectra are available, most of which are available in indexed form. Spectroscopic theory will be explained in terms of very simple molecules, and then extensions will be briefly indicated to use with construction composites. FTIR Spectrum Analysis: Currently we match with a library of 250,000 spectra. 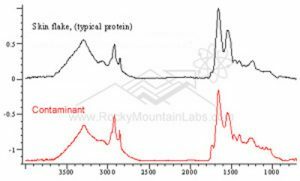 At Rocky Mountain Labs, we utilize fourier transform infrared spectroscopy to determine the types of molecular structures that are present in a variety of materials. 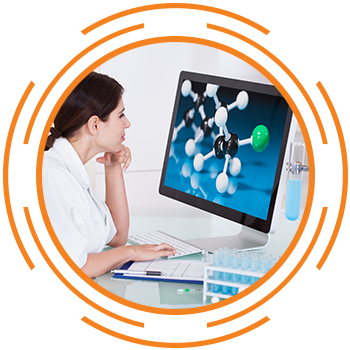 This process is often used to analyze and identify organic and inorganic compounds, like resins, starches, nucleic acids, enzymes, lipids, and proteins. In addition to fourier transform infrared spectroscopy, our materials science specialists also offer optical microscopy, auger electron spectroscopy (AES), energy dispersive x-ray spectroscopy (EDS), scanning electron microscopy (SEM analysis), cross sections and metallography, and much more. Get a quote today by reaching out to Rocky Mountain Labs.